A conversation style book talk with Abbas Milani and Ali Banuazizi about Abbas Milani's book "The Shah"
Abbas Milani is the Hamid and Christina Moghadam Director of Iranian Studies at Stanford University and a visiting professor in the department of political science. In addition, Dr. Milani is a research fellow and co-director of the Iran Democracy Project at the Hoover Institution. His expertise is U.S./Iran relations, Iranian cultural, political, and security issues. 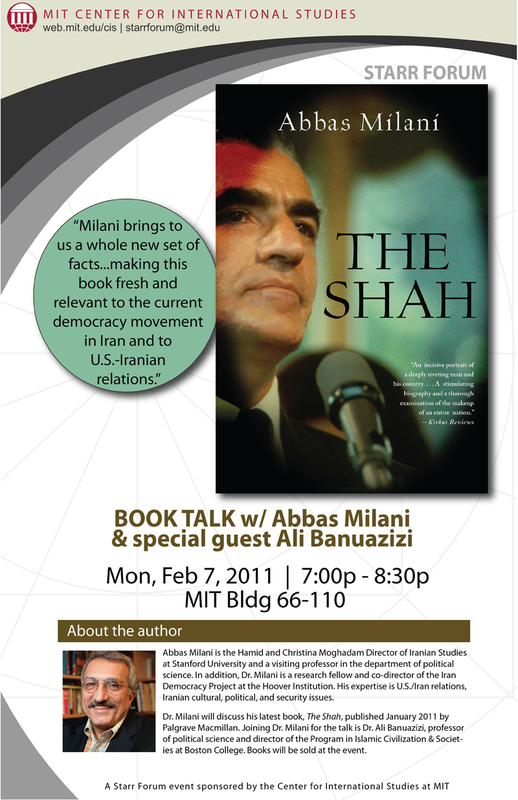 Dr. Milani will discuss his latest book, The Shah, published January 2011 by Palgrave Macmillan. Joining Dr. Milani for the talk is Dr. Ali Banuazizi, professor of political science and director of the Program in Islamic Civilization & Societies at Boston College. Books will be sold at the event.